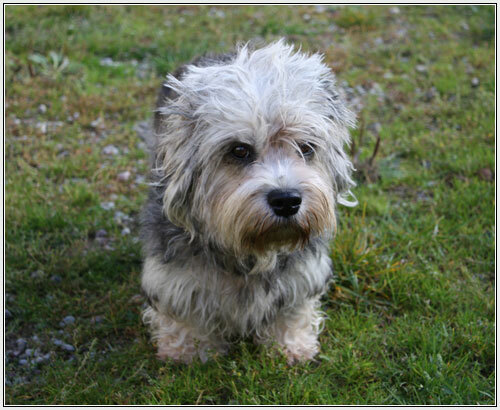 The Dandie Dinmont is a confident and intelligent little terrier, brave and independent. He'd rather be sergeant of the house than be babied. This delightful and entertaining dog is a clown as a companion. 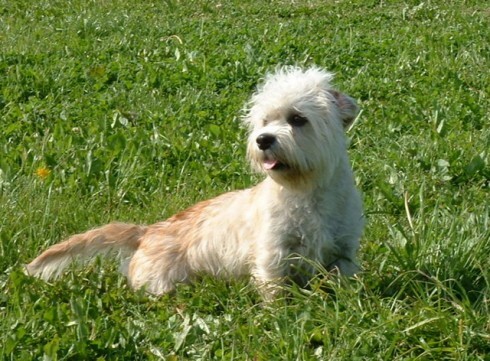 But as a terrier, he has his pride, and can sometimes seem shy or uninterested in strangers. 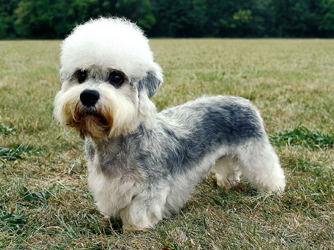 The Dandie Dinmont is intelligent, fond of children, and an excellent guard. The breed got its name from a funny character in a book written in 1814 by Sir Walter Scott. The character's name was Dandie Dinmont. 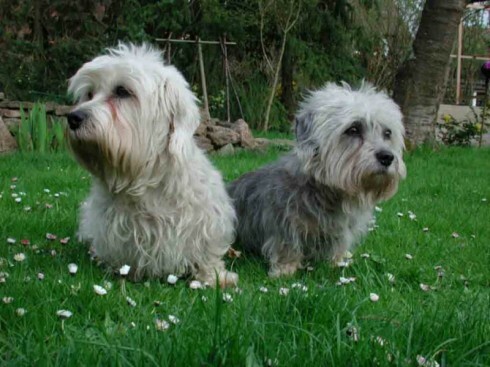 So you want to own a Dandie Dinmont Terrier? 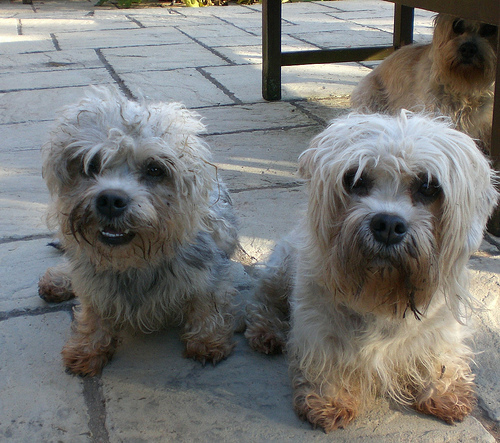 The Dandie Dinmont has a will of his own and will sometimes obey a command reluctantly. 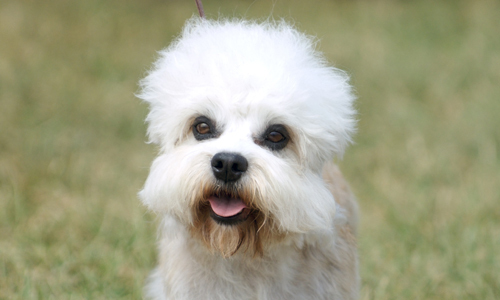 The Dandie's body coat is a mixture of hard and soft hairs giving the coat a crisp texture. 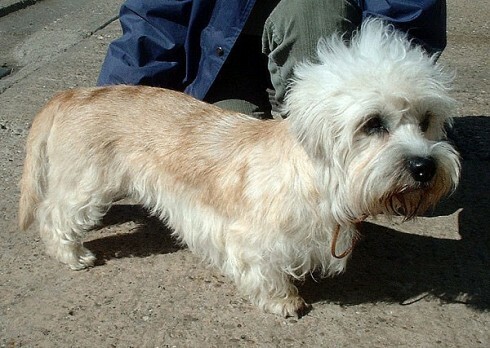 The intelligent, independent Dandie Dinmont Terrier has a determined friendly disposition, he makes a wonderful dog to live with, but if he ever encounters a mouse or a rat his hunting instincts come alive, so always keep your Dandie Dinmont Terrier on a leash or in a fenced-in, dog-safe area. 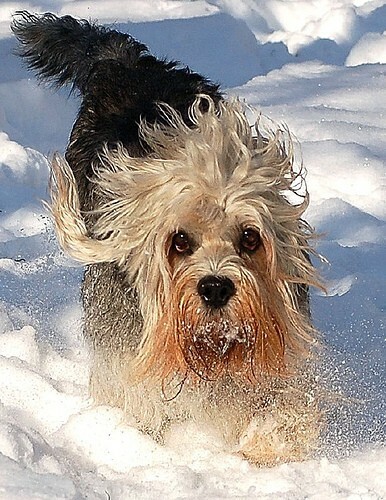 Regular coat care is necessary for the Dandie.. Distinctive head with beautiful silky covering, with large, wise, intelligent eyes offsetting long, low, weaselly body. Short, strong legs; weatherproof coat. Independent, highly intelligent, determined, persistent, sensitive, affectionate and dignified. silky hair not confined to mere ‘topknot’. Cheeks gradually tapering towards deep and strongly made muzzle. Muzzle in proportion to skull as three is to five. Top of muzzle has triangular bare patch pointing backwards to eyes from nose about an inch broad. Nose black. Rich dark hazel; set wide apart and low, large, bright, full and round but not protruding. Pendulous, set well back, wide apart, low on skull, hanging close to cheeks with very slight projection at base; broad at junction of head and tapering almost to a point, fore part of ear coming almost straight down from its junction with head to tip. Cartilage and skin of ear very thin. Length of ear, from 7.5-10 cms (3-4 ins). Ears harmonise in colour with body colour. 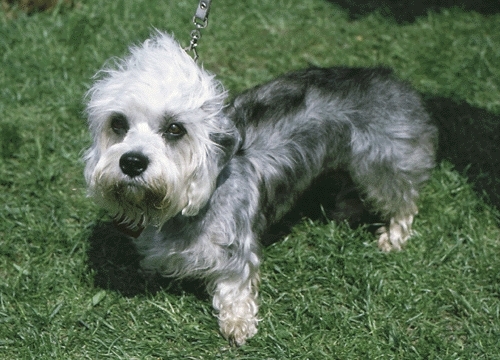 In a pepper dog, covered with soft, straight, dark hair (in some cases almost black). 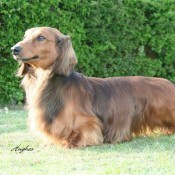 In a mustard dog, hair mustard in colour, a shade darker than body but not black. Both should have a thin feather of light hair starting about 5 cms (2 ins) from the tip, and of nearly the same colour and texture as ‘topknot’, giving ear appearance of a distinct point. This may not appear until after the age of two years. Jaws strong with a perfect, regular and complete scissor bite, i.e. upper teeth closely overlapping lower teeth and set square to the jaws. Any deviation highly undesirable. Teeth very strong especially canines which are extraordinary in size for a small dog. Canines fit well against each other, to give greatest available holding and punishing power. Inside of mouth black or dark coloured. Very muscular, well developed and strong, showing great power. Well set into shoulders. Shoulders well laid back but not heavy. Forelegs short with immense muscular development and bone, set wide apart and chest coming well down between them. Forearms to follow line of chest with feet pointing forward or slightly outward when standing. Bandy legs highly undesirable. Long, strong and flexible; ribs well sprung and round, chest well developed and well let down between forelegs; back rather low at shoulders having slight downward curve and corresponding arch over loins, slight gradual drop from top of loin to root of tail. Backbone well muscled. well let down. Dewclaws, if present, customarily removed. Round and well padded. Hindfeet smaller than forefeet. Nails dark but varying in shade according to colour of body. Flat or open feet highly undesirable. any way but with a curve like a scimitar, the tip when excited being in a perpendicular line with root of tail, set neither too high nor too low. When not excited carried gaily a little above body level. Strong, straight impulsion from rear, giving a fluent free and easy stride, reaching forward at the front. A stiff, stilted, hopping or weaving gait highly undesirable. Very important feature of the breed. Hair should be about 5cms (2ins) long. Double coat with a soft linty undercoat and a harder topcoat, not wiry but giving crisp feel to the hand. The coat should not ‘shed’ down the back, but should lie in pencils caused by the harder hair coming through the softer undercoat. The forelegs have feather about 5 cms (2 ins) long. Upper side of tail covered with wiry hair, underside not so wiry with neat feathering of softer hair. Pepper or mustard. Pepper: Ranges from dark bluish black to light silvery grey, intermediate shades preferred. Body colour coming well down shoulder and hips gradually merging into colour of legs and feet which varies according to body colour from rich tan to pale fawn. Profuse silvery white ‘topknot’. forelegs rather lighter than hair on fore part of leg. Some white hair on chest and white nails permissible. White feet undesirable. Hair on underside of tail lighter than on upperside which should be darker colour than body. The height at withers should be from 20-28cms (8-11ins), length from withers to root of tail should not be more than twice the height, but preferably 1inch to 2ins less. Weight: 8-11 kgs (18-24 lbs) for dogs in good working condition. The lower weights preferred.